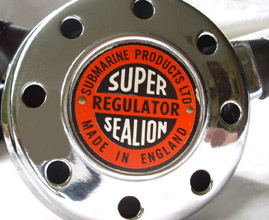 Submarine Products Super Sealion, made in England. 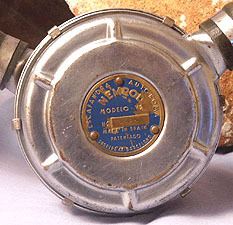 This was a single stage regulator from the early to mid 1960's. 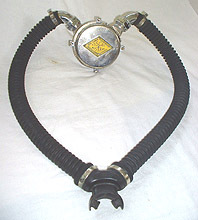 1960's Dive-Safe Loosco two hose regulator. I believe the Looscos were made from the late 1950's through the early 1970's. 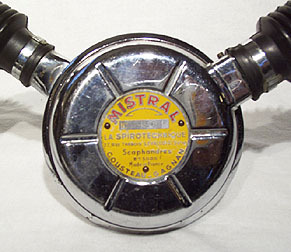 The earliest models had a curved metal mouthpiece, and later ones used the La Spirotechnique Aquastop rubber mouthpiece. I'm not sure if this example has the correct mouthpiece or not. 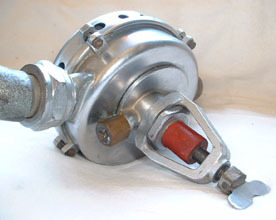 Early models mounted to a tank with a "B" nut, but later models had both DIN and international fittings. Early 1950's Siebe Gorman Essgee MK I, made in England. 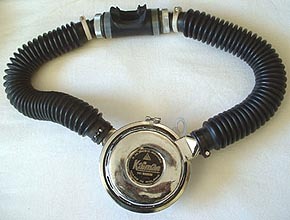 I believe this was the first model SCUBA regulator sold by Siebe Gorman. 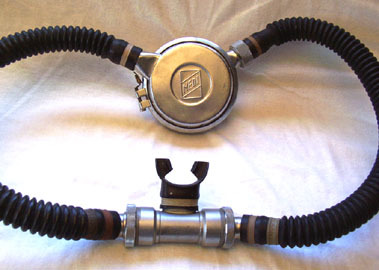 It is two stage, and has parts almost identical to the early Spirotechnique CG-45 and early US Diver's "Trademark" Aqualung. 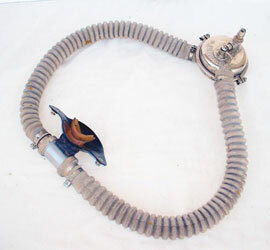 The hose assembly is not original to this regulator, but I believe it is similar to the original. Note that someone welded a "wing-nut" to the original yoke screw. 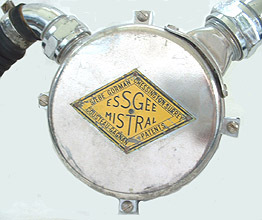 Siebe Gorman "EssGee" Mistral. 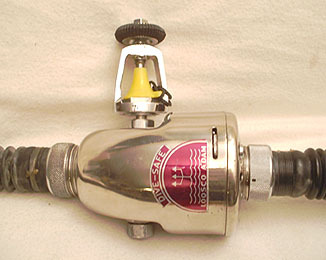 This single stage regulator was made in England around 1962. Production costs must have been very high with the complicated threaded elbows. 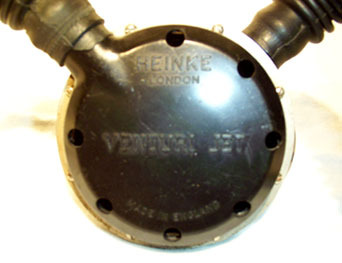 Heinke London, Venturi Jet, Made in England. Probably dates to the early 1960's. 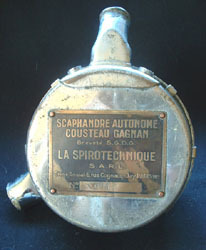 Original La Spirotechnique CG45 (Cousteau-Gagnan 1945), with a serial number in the mid 600's. 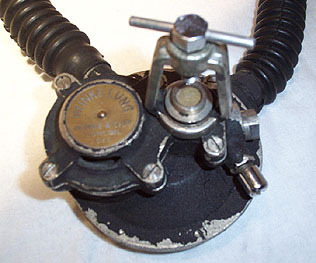 This rarely seen regulator probably dates to about 1946 or 1947. 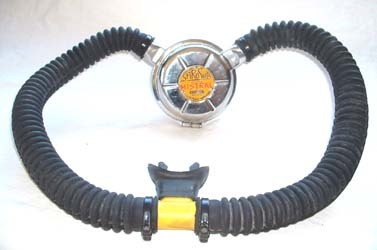 The rubber mouthpiece is original to the regulator, and I am looking for original hoses. 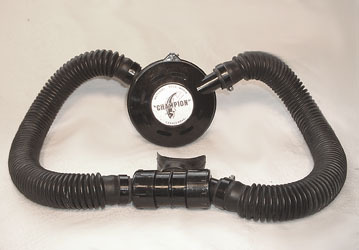 This model is the first production SCUBA regulator ever made. 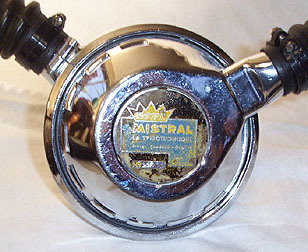 Mistral made in France by La Spirotechnique, the first diving company to sell Jacques Cousteau's patented "AquaLung". It is single stage, and almost identical internally to the US Divers Mistral. Circa 1960's. 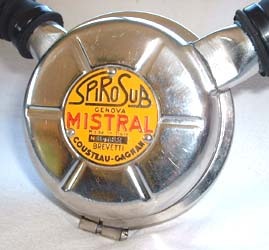 La Spirotechnique Royal Mistral, with Aqua-Stop mouthpiece. I am not sure how this differs from the original Mistral, other than the redesigned case. 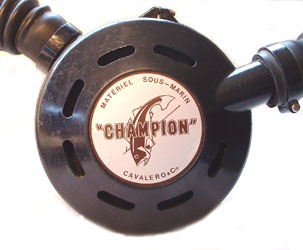 "Champion" two hose single stage regulator, made in France by Cavalero & Cie. Probably from the early 1970's. 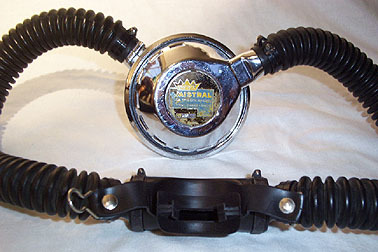 If the mouthpiece is original on this example, it is the same as the one used on the British Submarine Products Super Sealion shown above. The "Champion" is a very rare regulator and details are scarce. 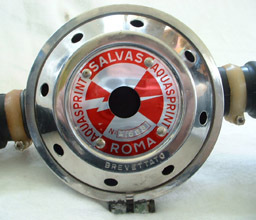 La Spirotechnique of France allowed an Italian company to manufacture Mistrals in Italy. This is a fine example of the Spiro Sub. Notice the unique yellow plastic mouthpiece tee. Circa early 1960's. 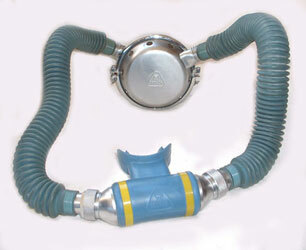 Salvas Aquasprint two hose regulator with factory face mask. Made in Rome, Italy, probably from 1952-54. 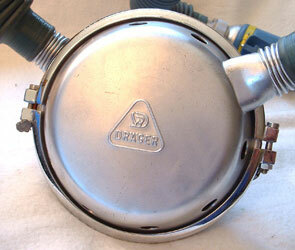 West German Drager Duomat. This is a two stage regulator from the early 1960's. 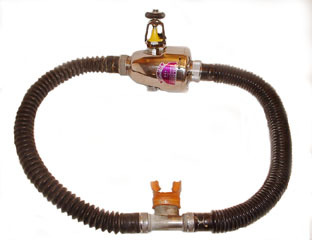 It is a high quality and good looking regulator with blue hoses and mouthpiece, yellow hose clamps, and quick release fittings on the mouthpiece. This model still has the lead seals from the factory that seal the body clamp screws. It is interesting how the hoses have darkened with age, yet the mouthpiece is still a bright blue. 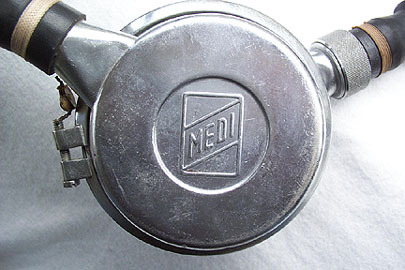 Medi military two stage, two hose regulator of Russian design, made in East Germany. With DIN fitting. Circa 1970's. 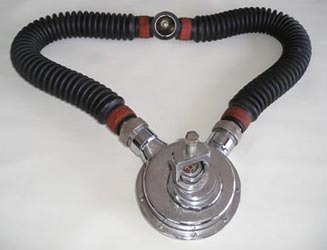 USSR (Russian) two hose military regulator. Probably made in the 1960's or 1970's. 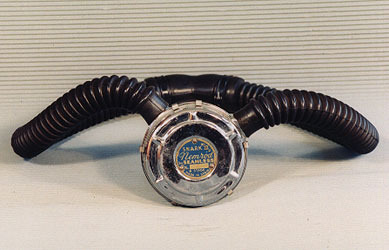 The hoses are canvas-covered rubber, similar to gas mask hoses. 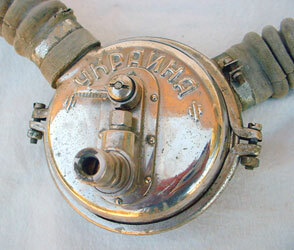 1960's double hose regulator, made in the Ukraine, USSR. 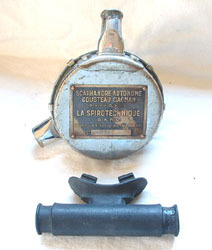 Very scarce model with a unique lever on the tank side that probably acts like a purge valve. 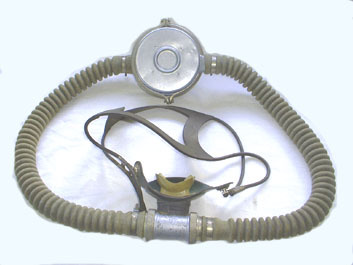 The hose and mouthpiece assembly are the same as used on the Russian models. 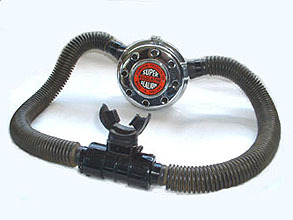 1960's Chirana PL401 double hose regulator, made in Czechoslavakia. 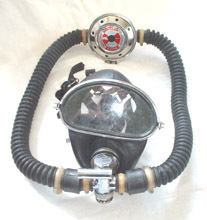 This model was used in conjunction with a full face mask, and the mouthpiece has no one-way check valves. 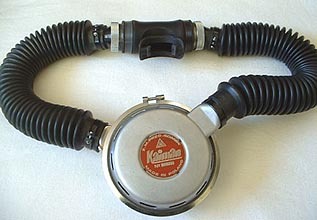 Two Polish Kaiman Regulators, probably made for the military. Circa 1960's. 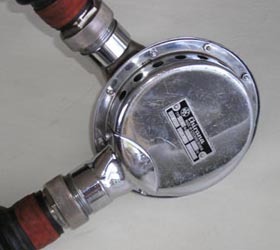 Two examples of Spanish Nemrod two hose, two stage regulators. The one on the left is an early V2 model, probably from the late 1950's (photo compliments of Stuart Jefferies). On the right is a Snark III by Seamless. 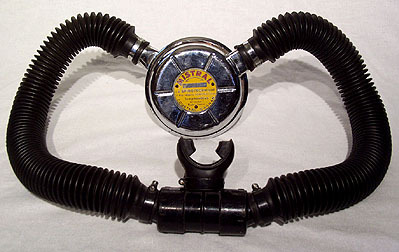 These regulators were sold in North America beginning in 1959. This model, with its polished chrome case, dates to the mid 1960's.